The history of Kaziranga as a protected area can be traced back to 1904, when Mary Victoria Leiter Curzon, the wife of the Viceroy of India, Lord Curzon, visited the area. After failing to see a single rhinoceros, for which the area was renowned, she persuaded her husband to take urgent measures to protect the dwindling species which he did by initiating planning for a their protection. 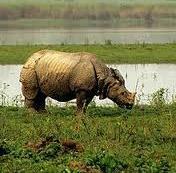 On 1 June 1905, the Kaziranga Proposed Reserve Forest was created with an area of 232 square km.